Welcome to another weekly Sketch Challenge! 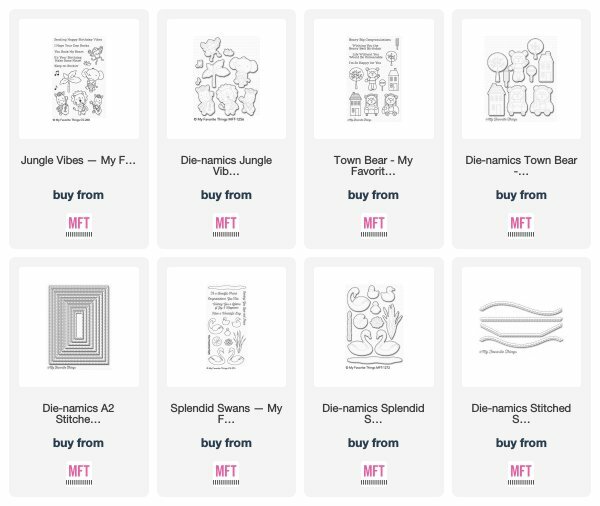 Turn each inspiring sketch into a mini work of art to add to your stash — you could also add $50 worth of brand new MFT to your collection! Now that is a win-win. Below you'll find Sketch 372. Create cards, scrapbook layouts, home decor, treat containers, mixed media, etc. using this week's sketch and be sure to link your project below for a chance at the weekly My Favorite Things Gift Voucher. 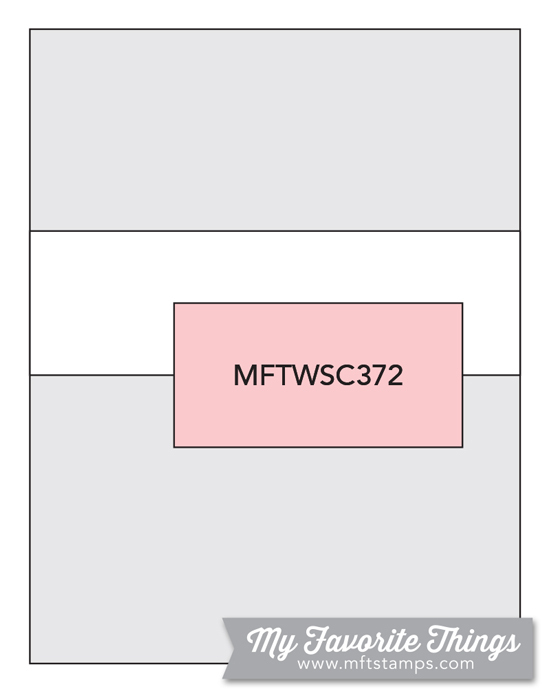 MFT products are encouraged, but not required. We just want to see what this week’s sketch inspires you to create! You can enter your cards for this week's challenge in the Inlinkz Link Up at the bottom of this post. 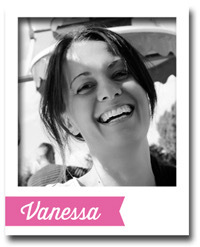 We're welcoming Vanessa Menhorn back to the Challenge blog today with her take on this week's sketch. 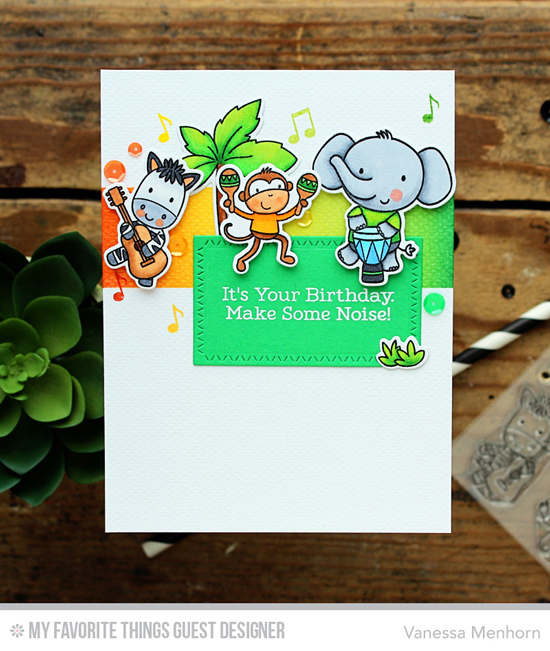 Vanessa created a jungle party on her card complete with rocking safari animals and a fun, bright colorful combination. She kept her design similar to the sketch with her main images and sentiment panel stretching across the card front. Karolyn created a stamped forest across her card front, providing a vibrant landscape for her adorable town bear. The addition of twine adds dimension to her card while grounding her scene on her white backdrop. 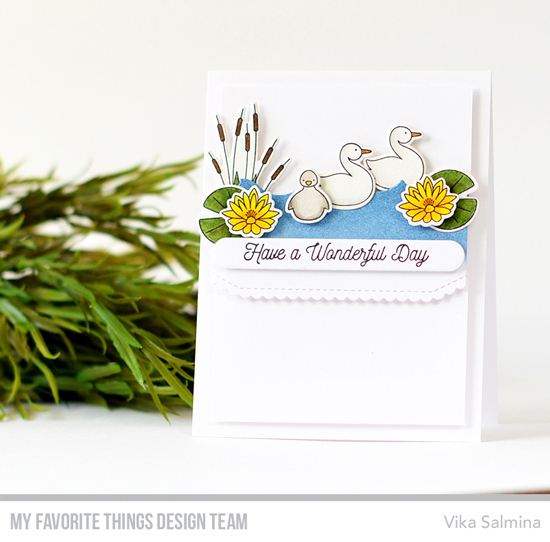 A serene scene complete with a family of swans works beautifully for this week's sketch. Vika added just the right amount of color to complement the softness of her design while still making a bold statement. Congratulations, Sundaystamper! You are the randomly selected winner of last week’s sketch challenge. You can view all the entries for last week’s challenge HERE. Now, it's your turn. You have until Tuesday, February 20th, at noon EST to add your link and be eligible for the prize of $50 in MFT Cash to be spent in the MFT boutique. Winners are chosen at random, so everyone has a chance! Download previous sketches in handy PDF format on our Printable Resource Page HERE. Watch for shout-outs on the blog every Tuesday, too! We'll feature fun, unique, clever, and noteworthy projects submitted using MFT products with design tips and trend talk. Who knows? You might be SPOTTED! Share your cards on Instagram, Twitter, and Facebook using the hashtag #mftstamps. Join the fun at our MFT Insiders group on Facebook! So thrilled to have won!!! Thank you!!! We want to see how you're being inspired! Tag #MFTStamps when you share your projects via social media. A new challenge introduced every Wednesday. A new color challenge the 2nd and 4th Thursday of every month. A new challenge introduced every month. The My Favorite Things challenge blog is a place where paper crafters of all styles can get together and share their love of MFT through weekly and monthly challenges. From sketch challenges to color challenges, we've got you covered with ideas and inspiration to get you creating in fun and productive ways. 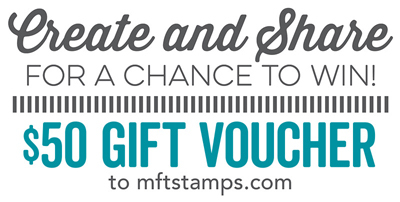 Make sure to tag #MFTStamps on your social media sharing so we can see how you're being inspired! © Copyright 2014 My Favorite Things. All rights reserved. Simple theme. Powered by Blogger.